Mayor David Narkewicz will kick-off the event with a ribbon cutting of the bench in front of Northampton City Hall and share his thoughts on the BenchWalk event. The Youth Commission will then speak briefly about BenchWalk. Afterwards, volunteers will be handing out BenchWalk maps outlining the benches locations, artists, and donors. Everyone is encouraged to attend the event, visit the benches, and meet the different artists. A total of 13 benches were painted by artists Sally Curcio, Cassandra Bils, Chris Sanborn, Anastasia Keck, Hannah Reed-Coates, Catherine A. Kenneally, Aubrey Halket, Joshua Dietz, Chelsea Greene, Sophie Theroux, and the Northampton Public Elementary Schools, and the Northampton Mayor’s Youth Commission. Several Northampton groups have donated to BenchWalk with Smith College, Hotel Northampton, and Northampton Community Television leading the way by donating $1,000 each. Other donors include Goggins Real Estate, GoBerry, Florence Bank, Smith College Museum of Art, and Thornes Marketplace. Foster Farrar, Home Depot, and Rust-Oleum all donated supplies for BenchWalk. The Youth Commission is still looking for businesses to donate and help support BenchWalk so they can meet their fundraising goals. The Youth Commission encourages all businesses and organizations to help support BenchWalk by visiting https://unipaygold.unibank.com/Default.aspx?customerid=1311 to donate. 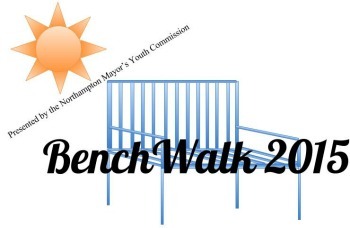 Anyone interested in donating, please visit www.northamptonma.gov/benchwalk or email nohobenchwalk@gmail.com.